Using drone mapping for construction is becoming increasingly faster, less expensive and more accurate than traditional methods. Several recent case studies back up this claim, especially when it comes to surveying, monitoring, managing and measuring the progress of a construction project. In fact, a recent commercial drone use report by Goldman Sachs says construction will be the biggest commercial sector for drone use in the near future. Drone mapping has even upped construction firms’ competitive edge when it comes to winning bids for new projects. In this coming year alone in the U.S., drone-based services will provide an estimated savings of $1.4 billion to construction companies, according SkyLogic Research (a market analysis company for commercial drones). What’s more, SkyLogic projects that value to grow 15 percent year over year over the next five years, totalling $9.4 billion. A major area in which drones have improved the cost-efficiency of construction work is in the area of earthwork analysis. One of the most compelling stories comes from Brasfield & Gorrie, one of the nation’s largest construction firms, based in Birmingham, Alabama. After the initial earthwork was done at the 61-acre site of a new hospital the firm was building, the site manager was concerned that it didn’t yet match what had been designed. So he enlisted the help of a local drone company to map the site and compare it to the plans. Mapping the area by drones allowed the field engineer to determine the difference between the current overall site grade and the proposed finished grade much quicker than by traditional means, while providing much more accurate data at about one-third the cost. The drone flight took only an hour, and a 3D point cloud of the entire site was generated within hours. That same day, the drone team had also created an orthomosaic map, an elevation map and a 3D map. Because the maps would be used for comparative analysis, it was important the map overlay properly with the design drawings. So Brasfield & Gorrie incorporated ground control points, or GCPs, pinpointed by drone data instead of time-intensive ground surveys. This meant making sure each individual point within a map was geo-tagged to within a certain accuracy when compared to absolute global latitude and longitude values. 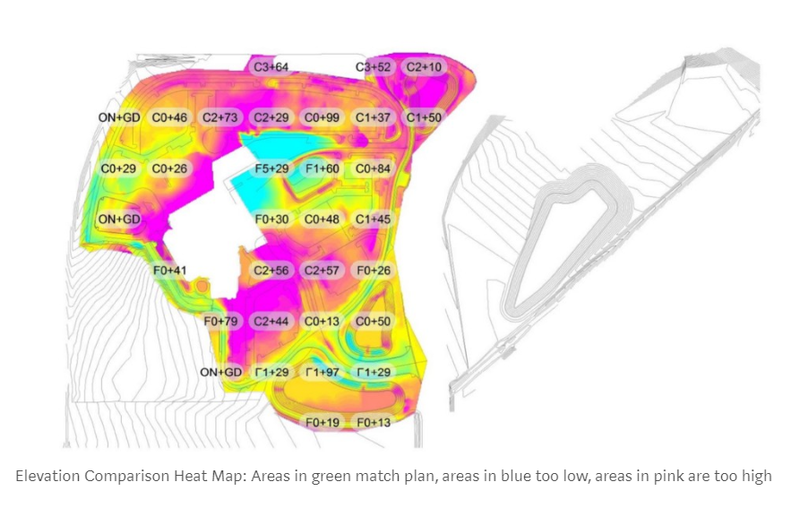 The final output (below) was a heat map showing the contractor’s actual earthwork progress as it compared to the original plan. Green indicated areas where actual elevations matched the design plans. Areas in blue were too low, while areas in red were too high. Overall, the time savings from doing this work via drone resulted in a project cost one-third the amount it would’ve cost to do it by traditional methods. Another convincing story about the merit of using drones in construction comes from Key Construction, based in the Dallas-Fort Worth area of Texas. Since drones shorten the time it takes to conduct site surveys, Key Construction has been able to place – and win – bids faster than the competition. For instance, this was a key part of winning a recent project bid to build a multiplex cinema. 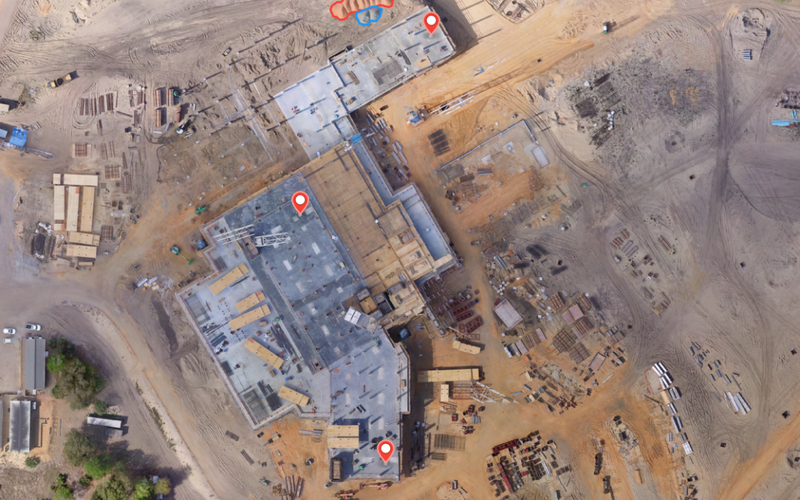 Drones – and continually evolving drone software specifically designed for the construction industry – also speed up the planning and design process with more accurate maps and 3D models. Key Construction, for instance, overlays drone maps with site plans such as utility, wastewater, and equipment clearances. They can also use their drone software’s built-in area and volume measuring, map annotations and notes, which can be shared team-wide . For more advanced oversight and planning, they export drone maps into BIM, GIS and CAD software. Weekly drone maps also reduce the amount of time spent walking a site to monitor progress and inspect for safety issues. It’s easy to repeat flights each week for consistency and create a comprehensive visual record of a project. Key Construction flies the job site bi-weekly to capture progress. Cloud-based drone software also allows the firm to quickly generate progress photos, annotated maps and reports on progress, accuracy and stockpile volumes. They can then easily and regularly share them with internal and external stakeholders. Real-time site conditions can also be compared with plans to catch deviations before they add weeks to the timeline.